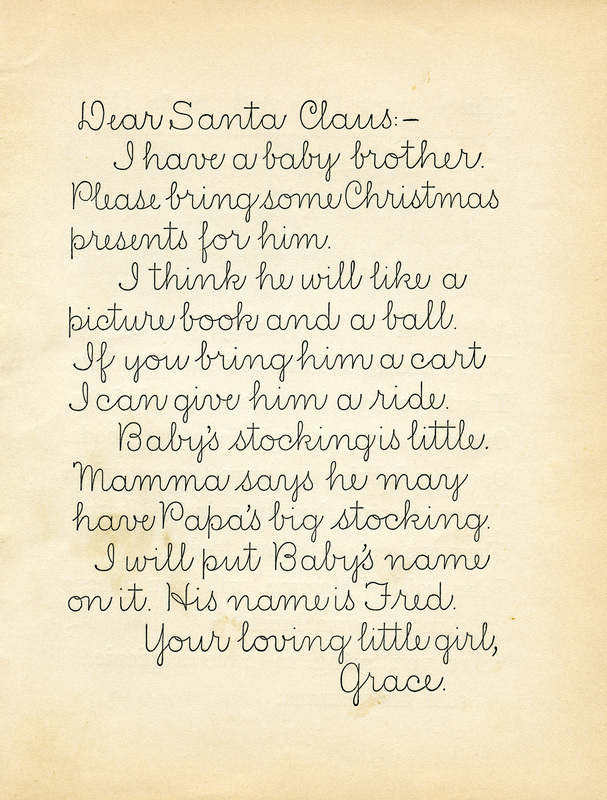 Here is an adorable vintage handwritten letter to Santa Claus. The little girl who wrote the letter has let Santa know that she has a new baby brother named Fred and she has asked Santa to please bring some Christmas presents for him. She gave Santa a few ideas of what she thinks her brother will like for a gift, including a picture book and a ball. The little girl has also suggested that if Santa will bring Baby Fred a cart, she will be able to give him a ride. She mentions in the letter that Baby Fred’s stocking is little but that her mom says he can use Papa’s big stocking and she will put his name on it. 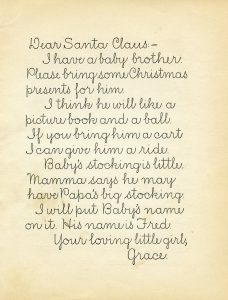 The letter is signed, “Your loving little girl, Grace.” I scanned the original page from Child Life A First Reader by Etta Austin Blaisdell and Mary Frances Blaisdell. The book was published in 1902. This is so sweet, adore this, archiving for future project. Thanks so much!! Lovely, only it cannot be handwritten. The letters are too identical.